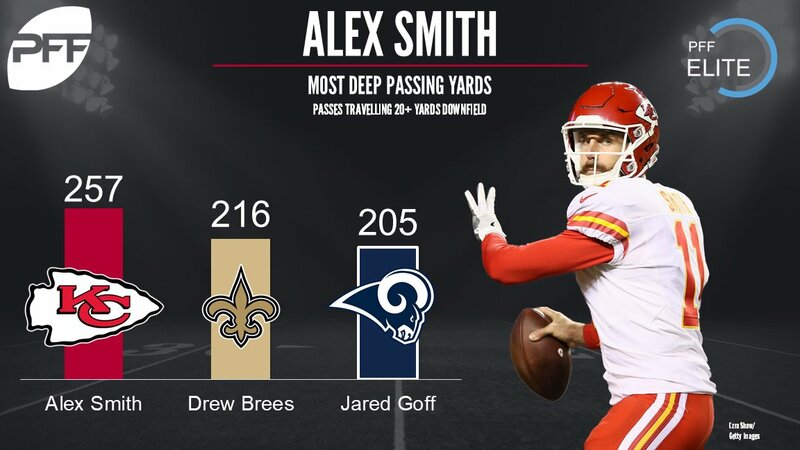 Checking in on another of the PFF Elite stats after Week 2 of the NFL season, this time we focus our attention on deep passing. Alex Smith hasn’t been any more aggressive this season, with 14 QBs having as many or more deep pass attempts, but he has been extremely accurate on those he has attempted as the Chiefs have schemed receivers open well. Only Carson Wentz has gone deep more than the 14 times Drew Brees has attempted a deep pass. Brees has completed six of those 14 but none have gone for touchdowns. Jared Goff has completed six of his nine deep pass attempts, scoring a touchdown and earning a passer rating of 146.8 on those deep shots so far this season, a marked improvement on his rookie season. Tom Brady also has 14 deep pass attempts this season, the same total as Drew Brees. Though he has fewer yards, he also had one of his passes dropped, and has been accurate on 50 percent of those attempts. In a high-risk offense, Carson Palmer is again at the sharp end of average depth of target, at 10.3 yards through two weeks (fifth). That translates to a dozen deep shots, completing five of them with one drop. He has also thrown an interception and one touchdown on his deep passes. 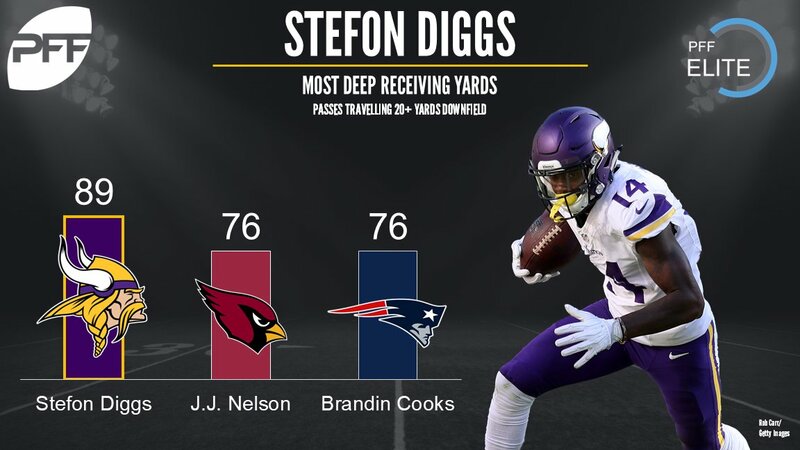 Six of the 14 targets Stefon Diggs has seen this season have been deep shots, and no player has as many deep receptions as the four he has hauled in. In fact, no other wide receiver has more than half of the total Diggs has amassed through two weeks. Just 23.1 percent of J.J. Nelson’s 13 targets this season have been deep shots, but he has caught two of the three deep passes thrown his way and scored a touchdown on one of them. Brandin Cooks has caught two of the three deep passes sent his way without dropping a pass, gaining 76 yards on those passes. Tyreek Hill hauled in a deep touchdown in week one against the Patriots thanks to a coverage bust on the back end within the New England secondary. Hill has only seen two deep targets, and his only catch was that touchdown, but it went for 75 yards and a score. Cut recently before being signed to the practice squad and then elevated to the game in Week 2, Rashard Higgins found himself as the Browns’ leading receiver against the Ravens. He caught two of the three deep passes thrown his way for 63 yards.